Yin Zhan is a researcher from China Academy of Sciences (CAS) who specializes in the developmental biology and the biological effect of endocrine disruptors. He is the assistant director of the Institute of Hydrobiology and heads the Water and Human Health Center in CAS. He is 2005 recipient of the National 100-Talent Programme and a 2009 recipient of the National Science Fund for Distinguished Young Scholars (NSFDYS). He received his doctorate degree on biology from the National University of Singapore in 1999. He conducted his postdoctoral research on pharmacy in the Case Western Reserve University in 2003 and later on molecular cardiology in the University of Pennsylvania. Water takes in everything. All pollutants manufactured on land will sooner or later find themselves in ponds, lakes, rivers and the ocean. Some decompose in water but some are persistent and stay indefinitely. 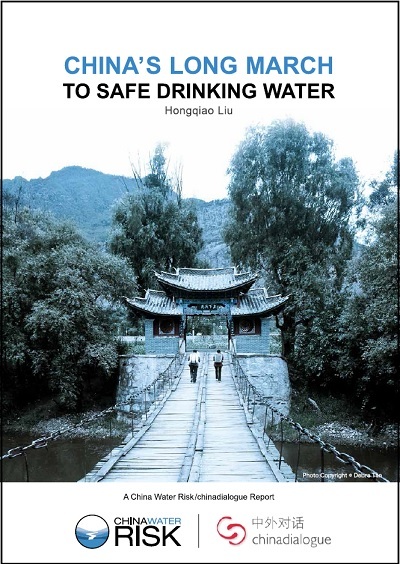 To secure drinking water safety, the Chinese government published the harshest-ever drinking water quality standard in 2007, with as many as 108 test indicators. Meeting the standard is proving a challenge for many cities, let alone tackling pollutants not included in the standard. In late 2015 Chinese researchers detected plastic particles in salt – mainly Polyethylene terephthalate (PET) and Polyethylene (PE) used in plastic bottles. Back in 2014, CCTV news reported the detection of antibiotics in tap water causing national concerns over drinking water safety. Further back in 2010, Greenpeace detected Octylphenol (OP), Nonylphenol (NP) and Perfluorooctane sulfonates (PFOS) – all endocrine disruptors – in wild fish caught from the Yangtze River. The list of contaminants goes on. 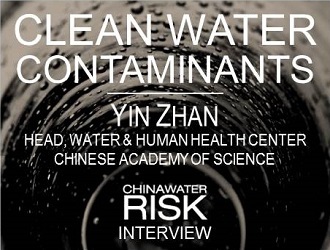 To understand such “emerging contaminants” and their impact on health, China Water Risk spoke with Yin Zhan, who heads the Water and Human Health Center of the Chinese Academy of Sciences. Yin walks us through his thoughts on the toxins and also shares solutions such as paramecium, fishes and other bio-detection methods to help secure drinking water safety in China’s big cities. China Water Risk (CWR): Let’s start with your research on endocrine disruptors. What are endocrine disruptors and how do they affect us? Yin Zhan (YZ): An endocrine disruptor is a synthetic chemical that when absorbed into the body either mimics or blocks hormones and disrupts the body’s normal functions. Our research mainly focuses on the toxicology of the endocrine disruptors on living bodies. In the past, we often refer the endocrine disruptors as “environmental hormones” or “environmental endocrine disrupting compounds (e-EDCs)” because they bring about similar effects to hormones, such as oestrogen. But we have found some specific endocrine disruptors, for example sodium pentachlorophenate (widely used in herbicide and bactericide), which further effects epinephrine and thyroxine. CWR: Since 2010 there have been various news reports of water and food products contaminated with endocrine disruptors. Two in particular are Greenpeace’s claim in 2010 regarding fish caught along the Yangtze and in 2012 when a Chinese water expert posted on Weibo that tap water contained acyeterion. Should we be worried? YZ: So far there are more than 80 endogenous chemicals or molecules are registered as e-EDCs, but we don’t fully understand each of their impacts on endocrine glands. Theoretically, their impact depends on their dosage. As scientific researchers, we aim to find the endocrine disruptors imitating the endogenous hormone compounds that can be found in the environment. However, not many suitable assays have been well developed yet. In the past 30 years, tens of xenoestrogens (chemical compound that imitates oestrogen) have been identified based on the Vitellogenin (VTG) Induction Assay. Our recent findings suggest that the adrenergic agents other than oestrogen can also induce the VTG in fish models, which suggests that many previously identified xenoestrogens might not be scientifically correct. Given this, we aim to develop a highly sensitive method to evaluate the disruption levels of these e-EDCs. This will require collaboration between endocrinology and environmental chemistry. However, we also understand that the next step of removing them more challenging. If we can’t remove them from water and food, evaluation means nothing; only adding psychological burden to the society. CWR: You also work on the water quality monitoring project of the South-to-North Water Transfer Project. Are there endocrine disruptors in the transferred water? YZ: We have more urgent problems to deal with – pollution that is visible to naked eye. I’m very concerned with the water quality in the downstream of Hanjiang River (the largest branch of Yangtze River). Downstream to the Danjiangkou Reservoir, which is the source of the middle route of the South-North Water Diversion Project there are five dams, with only an 80-metre height difference. If nitrogen and phosphorus pollution is left unregulated then it is highly possible that this part of the Hanjiang River could become “lakes of algae bloom”. CWR: Speaking of algae bloom, it might be one of the most significant and widespread water pollution problems in China. Some studies suggest a high correlation between algal toxin and liver cancer in local communities. Will this become a major problem for drinking water safety? YZ: Thick algae blooms block sunlight that other organisms need to live. They can also deplete oxygen levels in the water and starve fish and plants, damaging local ecology. Water containing algae blooms can result in odours and increased cost of drinking water treatment. I wouldn’t be too concerned about the health impact. Algal toxin is not very stable in the environment and it requires a relatively large doze to cause liver damage. No water body so far has been observed to contain such high level of algal toxin. However, we do need more studies to explore practical solutions in controlling and preventing algae bloom. We need to be able to control algal bloom before we can tackle controlling and removing endocrine receptors. If we are unable to control algal bloom then how can minutely manage specific e-EDCs. CWR: More “emerging contaminants” are now detected in China’s water bodies. Among the list are antibiotics, which are just as concerning as endocrine disruptors. Still, many of the emerging contaminants are not included in the current drinking water standard or water source standard. How should we deal with these challenges? YZ: For antibiotics, I don’t think the problem is as serious as the public assumes, at least not as serious as Persistent Organic Pollutants (POPs). “If we can strictly control the consumption of antibiotics, we have great chance to reduce the discharge quantity in water. Antibiotics can breakdown in the environment and also be metabolized by the human body, thus health effects and intergenerational transfer shouldn’t be that severe. If we can strictly control the consumption of antibiotics, we have great chance to reduce the discharge quantity in water. However, I’m concerned with many other “emerging contaminants”. Just to name a few, various studies have detected nanometer materials and plastic particles in water and even in salt. The consumption and discharge of such materials are still growing, but we have very limited knowledge on their impacts in water and other ecosystems, let alone human health. CWR: China aims to secure drinking water safety by 2020. Can you share some of your experience with bio-monitoring of tap water quality control? YZ: We now want to develop what we call a call “bio-monitoring system” for drinking water surveillance and early warning. The basic idea is to install an early warning system in the production chain of drinking water treatment plants by applying a combo of living body “reagents” made from protozoa, bacteria and fishes. The bio-monitoring system can be placed before or after water treatment process to test whether the water is clean enough for the living body to survive, which indicates high water quality and no serious contamination. Ciliates (a kind of protozoa), for example, require very high water quality to survive making it a very sensitive indicator to test water quality and the intergeneration effect of toxins – if there are any. It’s impossible for water treatment plants to test each of the hundreds of potential contaminants in water by chemical analysis but the bio-monitoring system would be sensitive enough to reveal once contaminations like benzene enter the water supply system. If Lanzhou city had installed such bio-defences, it should have immediately been aware of the contamination and cutting off the water supply would have been avoided. CWR: Hong Kong has been using zebra fish and luminous bacteria to monitor its public water quality for years. Are you positive to apply such practice in mainland China? YZ: We did a calculation for the Water Supplies Bureau of Ningbo city in Jiangsu province. The total cost for additional bio-defence monitoring is roughly RMB2-3 million per year, which is a small amount of money for a city of ten million residences. If we can avoid incidents like Lanzhou with a cost of RMB3-5/person/year, I think it’s a cost-beneficial investment to secure drinking water safety. 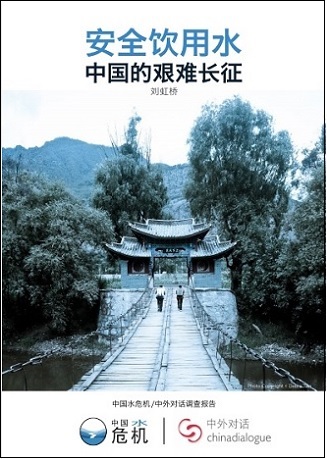 Beautiful China 2020: Water & The 13 FYP – Tireless efforts will be made towards building a Beautiful China. See what this means for water. Key Water Policies 2015 – 2016 – China has released a host of key water-related policies, stay on top of them with China Water Risk’s review. China Needs Managed Aquifer Recharge – Managed Aquifer Recharge (MAR), by reclaiming treated wastewater, can help better manage China’s water resources and increase resiliency to climate change. Experts of China MAR Working Group discuss opportunities & challenges. Cancer Villages: Toxic Tipping Point? – With official recognition of cancer villages in 2013, we reviewed 255 media reports of such villages to look at their spread and industries that may be responsible. Is this the start of a long costly road to clean up?